Rio de Janeiro has entered the route of low-cost international airlines. 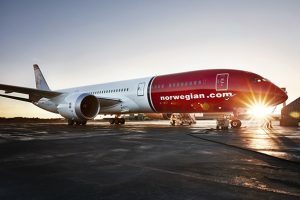 Norwegian, Europe’s third-largest airline, began selling the first direct flight tickets in November, connecting London, UK, to Rio. Operations will begin in March 2019. Since October, the Chilean low-cost Sky Airline flies from Santiago, Chile, to Rio de Janeiro, among other Brazilian cities. Embratur, the tourism promoting company linked to the Brazilian government, expects around 100 new flights throughout the country by April 2019. Considering only the operation of the Norwegian company, the expectation is to generate an impact of $ 117 million Reais (£23.512.259) in the Brazilian economy within a year. “We calculate this based on the number of seats in the aircrafts multiplied by the money spent by foreign tourists in Brazil,” Alisson Andrade, the coordinator of Tourism Market and Competitive Intelligence, explains. According to Norwegian, fares start at $1,200.00 Reais (£240) per person and per route. “Our new route in Rio de Janeiro breaks the monopoly on direct flights between the UK and Brazil, as we are committed to reducing fares and making flights more accessible to tourists and business travelers,” says Bjorn Kjos, CEO of the Norwegian group. Latin America keeps being the region that offers the most flights to Brazil. In November, there were 2,661 flights. Then Europe (1,020), North America (960), Africa (159) and Asia (141). The new guaranteed flights will depart from countries such as Israel, Italy, Netherlands, Portugal, France, United Kingdom, Argentina, Bolivia, Ecuador, Chile, Paraguay and the United States. There are 54 new offers and 44 additional frequencies. In all, there will be 144 weekly frequencies, in addition to those already operating regularly between international destinations and Brazil.